I mentioned this sometime in an earlier thread, but to keep things tidy (and give a lot of you the opportunity to see past cards), I'll post them in one thread. Keep in mind that some cards may not be posted in chronological order; rather I have separated them into groups based on what they do [their set IDs will be listed in the group]. I made a few things out of order, so that's why things are like that. Anything that is new and not been posted prior has name in RED [which, right now, is limited to the senior Swords of Justice (you've already seen Keldeo and main thread is still active on page 1 right now)]. This card cannot be destroyed by battle with Dragon-Type monsters. When a Fairy-Type monster attacks: It gains 600 ATK during the Damage Step only. Once per turn, you can target 1 monster you control, except this card: It cannot be destroyed by battle. When this card is destroyed (either by battle or a card effect): Return it to the Extra Deck, then target 1 of this card's Synchro Material monsters in your Graveyard; Special Summon that target. When a Winged Beast-Type monster attacks: It gains 600 ATK during the Damage Step only. Once per turn, you can target 1 monster your opponent controls: Destroy that target; gain Life Points equal to its Level or Rank x 200 points. When this card is destroyed (either by battle or a card effect): Return it to the Extra Deck, then destroy all monsters on the field. All effects that add or subtract ATK or DEF are reversed. Once per turn: You can target 1 monster on the field; change that target's ATK and DEF to its printed ATK and DEF, and if you do, destroy any Equip Cards equipped to that target. When this card is destroyed: Both players send cards they control to the Graveyard until they only control 5 cards. The effects of monsters that battle this card are negated. Once per turn, during either player's turn, when a Spell/Trap is activated that targets a card you control: You can discard 1 card; Negate the activation, and if you do, destroy it.When this card destroys an opponent's monster by battle: Your opponent takes 800 damage. If a face-up "Black Desire Dragon Zekrom" you control attacked this turn, this card gains 500 ATK until the end of the Battle Phase. 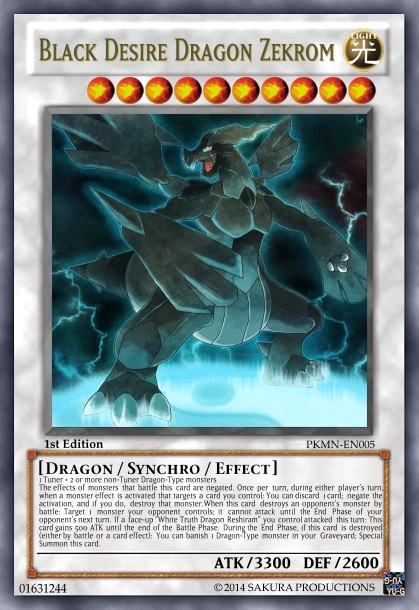 During the End Phase, if this card is destroyed (either by battle or a card effect): You can banish 1 Dragon-Type monster in your Graveyard; Special Summon this card. The effects of monsters that battle this card are negated. 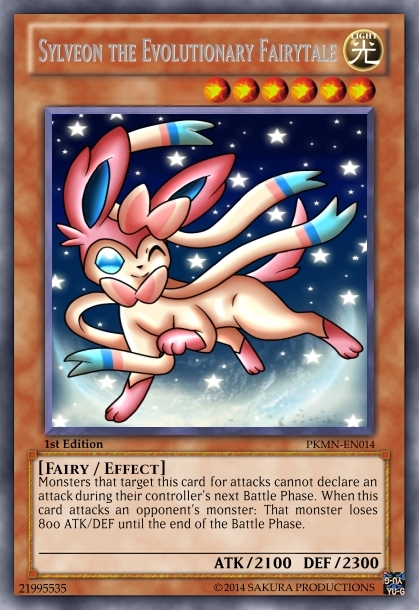 Once per turn, during either player's turn, when a monster effect is activated that targets a card you control: You can discard 1 card; negate the activation, and if you do, destroy that monster.When this card destroys an opponent's monster by battle: Target 1 monster your opponent controls; it cannot attack until the End Phase of your opponent's next turn. If a face-up "White Truth Dragon Reshiram" you control attacked this turn: This card gains 500 ATK until the end of the Battle Phase. During the End Phase, if this card is destroyed (either by battle or a card effect): You can banish 1 Dragon-Type monster in your Graveyard; Special Summon this card. During either player's turn, when your opponent activates a monster effect: They can discard 1 card, if they do not, negate that monster's effect until the End Phase. 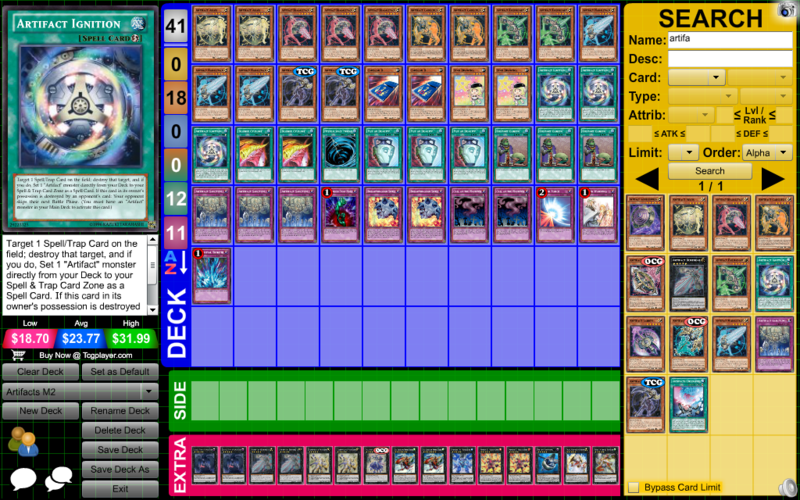 Monsters your opponent controls lose 500 ATK/DEF and cannot change their Battle Positions, except by a card effect. 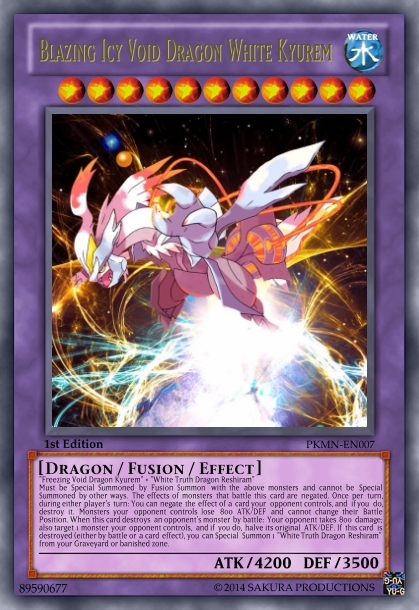 During either player's turn: You can return this card to the Extra Deck and banish 1 "White Truth Dragon Reshiram" or "Black Desire Dragon Zekrom" you control or in your Graveyard; Special Summon 1 monster from your Extra Deck that lists both monsters as a Fusion Material. (This is treated as a Fusion Summon). 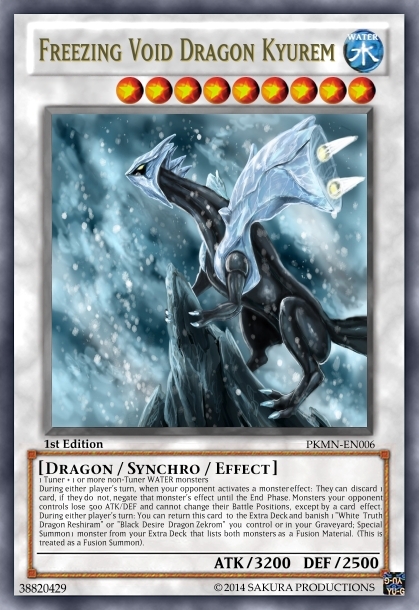 "Freezing Void Dragon Kyurem" + "White Truth Dragon Reshiram"
Must be Special Summoned by Fusion Summon with the above monsters and cannot be Special Summoned by other ways. The effects of monsters that battle this card are negated. Once per turn, during either player's turn: You can negate the effect of a card your opponent controls, and if you do, destroy it. Monsters your opponent controls lose 800 ATK/DEF and cannot change their Battle Position. When this card destroys an opponent's monster by battle: Your opponent takes 800 damage; also target 1 monster your opponent controls, and if you do, halve its original ATK/DEF. 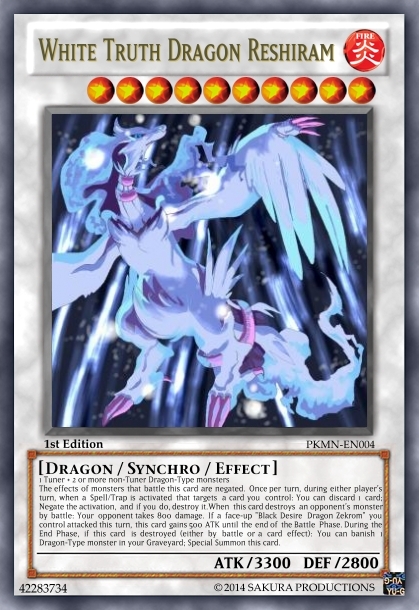 If this card is destroyed (either by battle or a card effect), you can Special Summon 1 "White Truth Dragon Reshiram" from your Graveyard or banished zone. 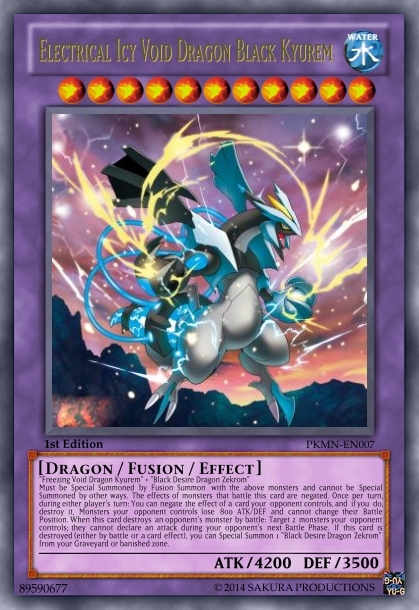 "Freezing Void Dragon Kyurem" + "Black Desire Dragon Zekrom"
Must be Special Summoned by Fusion Summon with the above monsters and cannot be Special Summoned by other ways. The effects of monsters that battle this card are negated. Once per turn, during either player's turn: You can negate the effect of a card your opponent controls, and if you do, destroy it, Monsters your opponent controls lose 800 ATK/DEF and cannot change their Battle Position. When this card destroys an opponent's monster by battle: Target 2 monsters your opponent controls; they cannot declare an attack during your opponent's next Battle Phase. 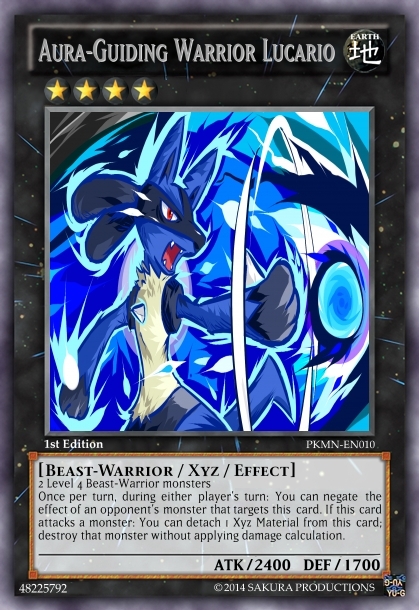 If this card is destroyed (either by battle or a card effect), you can Special Summon 1 "Black Desire Dragon Zekrom" from your Graveyard or banished zone. Once per turn, during either player's turn, if card(s) you control would be destroyed or targeted by your opponent's card effect: You can banish the top 2 cards of your Deck and target card(s) your opponent controls that would be an appropriate target(s); that effect now targets the new target(s). When this card destroys an opponent's monster by battle: Gain Life Points equal to that monster's Level or Rank x 200 points. You take no battle damage involving battles with LIGHT monsters your opponent controls. This card can attack all monsters your opponent controls once each this turn. Once per turn, during either player's turn: You can banish 1 LIGHT monster in your Graveyard; negate the effect of a card that targets a monster you control, and if you do, destroy it. Monsters that target this card for attacks cannot declare an attack during their controller's next Battle Phase. When this card attacks an opponent's monster: That monster loses 800 ATK/DEF until the end of the Battle Phase. Stat pattern is the higher of their ATK/DEF stats, times 10; then increased by 1000. Once per turn, during either player's turn: You can negate the effect of an opponent's monster that targets this card. If this card attacks a monster: You can detach 1 Xyz Material from this card; destroy that monster without applying damage calculation. Any battle damage this card inflicts when it battles a monster is increased by 600 points. 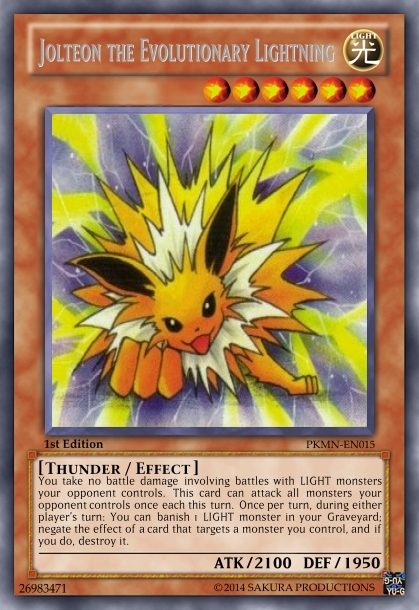 If this card has "Aura-Guiding Warrior Lucario" as an Xyz Material, it gains these effects. ● If this card attacks a monster: You can detach 1 Xyz Material from this card; banish that monster without applying damage calculation. ● Once per turn, during either player's turn: You can negate the effect of an opponent's card that would target this card, and if you do, destroy it. This card is also treated as a Psychic-Type monster. If this card destroys an opponent's monster by battle: You can target 1 monster your opponent controls; halve its ATK until the End Phase of your next turn. 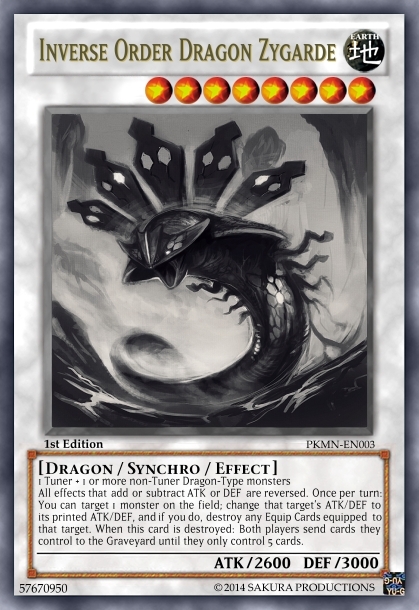 Once per turn, during either player's turn, if you control another Dragon-Type monster: You can negate the activation and effect of a card your opponent controls. "The scarlet dragon protecting the secret garden, hear this wish deep within my heart. 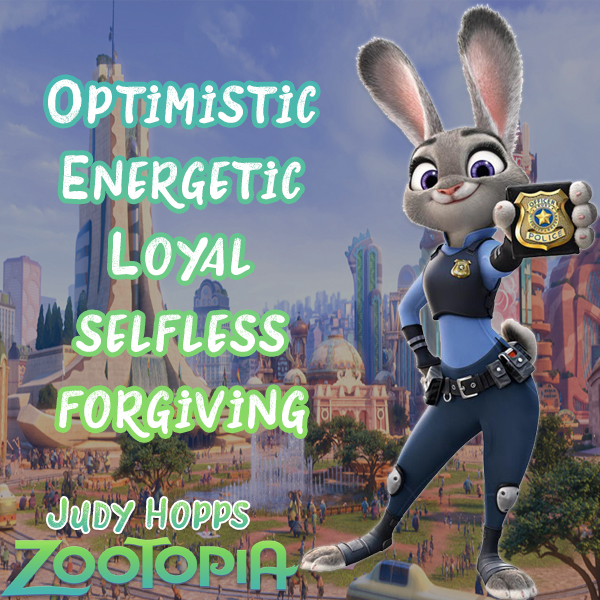 Become the power that protects my friends! Synchro Summon! 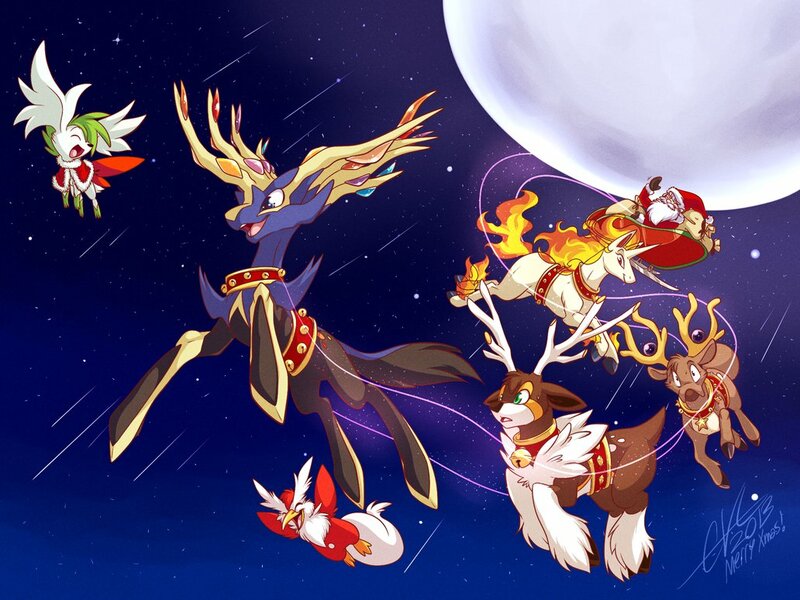 Arrive in light, Psychic Dragon Princess Latias!" This card is also treated as a Psychic-Type monster. If this card destroys an opponent's monster by battle: You can target 1 monster they control; inflict damage to your opponent equal to half its ATK. When this card is destroyed and sent to the Graveyard: Target 1 cards your opponent controls; destroy that target. That card's effects cannot be activated. "The azure dragon that defends the garden of Alto Mare, hear the mighty roar shaking souls within the heavens! Become the fierce sword of a thousand Aeons! Synchro Summon! Descend, Psychic Dragon Prince Latios!" I'd like to note that these were originally designed for another Written archetype in RC from November or somewhere around there; also the ace cards of two characters in a 5Ds spinoff fic, hence why they have summoning chants beneath (and take on a 5Ds Clear Mind vibe). 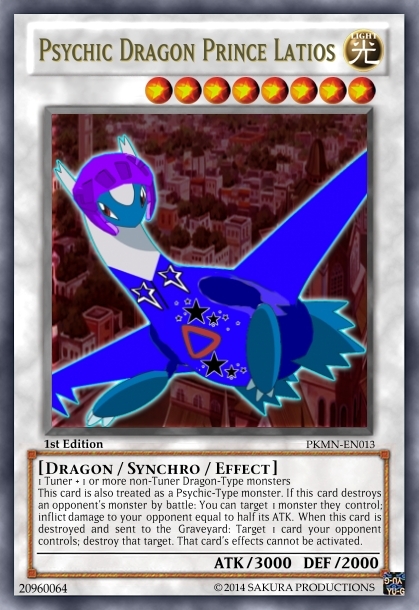 When this card is Synchro Summoned: Return all other monsters on the field to their owner's hand. This card cannot attack the turn you activate his effect. During your opponent's Main Phase 1: Monsters your opponent controls lose 200 ATK/DEF x their Level/Rank. Once per turn: You can inflict 800 damage to your opponent. You can only activate this effect of "Heatran, Defender of the Lava Dome" once per turn. Effect is based on a wall set that Heatran is capable of running. 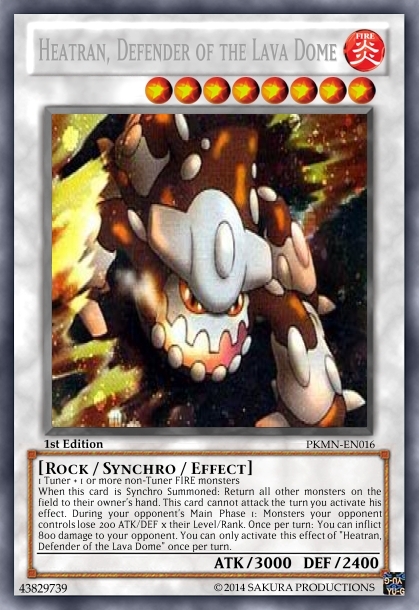 First effect is Stealth Rock (though factoring type advantages in Yugioh doesn't work, it simply hits the monsters based on their Level/Rank; in a way, the lower your Level/Rank, the less "weaknesse" you have to SR). Second effect is Magma Storm (or Fire Spin, both do the same thing except for the damage output); opponent is sealed from using the affected monster as Extra Deck fodder and your opponent takes constant burn. Until the end of your 4th turn after this card was Summoned, "Sacred Swordsman" monsters you control gain 300 ATK/DEF during each of your Standby Phases. This card is unaffected by your opponent's monster effects. At the start of the Battle Step, if this card battles a monster: You can change that monster to face-down Defense Position. Cobalion gives a small bonus to the other Swords of Justice, including itself. Second effect references its Steel typing and can protect self against Exciton, 101 and some other relevant threats. Last effect is based on Iron Head's flinching chance. The colored swords in background represent the other three Swords of Justice; given Cobalion is the assumed leader of them. This card can make a second attack during each Battle Phase. Once per turn, if this card destroys an opponent's monster by battle: You can target 1 monster your opponent controls; destroy that target. Until the end of your 8th turn after this card was Summoned, it gains 300 ATK during each of your Standby Phases. Once per turn: You can target 1 face-up monster your opponent controls; gain Life Points equal to half that target's ATK, and if you do, its effects are negated until the end of this turn. At the start of the Damage Step, if this card battles a monster: You can target 1 face-up monster your opponent controls; that monster's ATK and DEF are halved. Until the end of your 4th turn after this card is Summoned, it gains 300 ATK/DEF during each of your Standby Phases. When this card attacks a Defense Position monster, inflict piercing battle damage to your opponent. 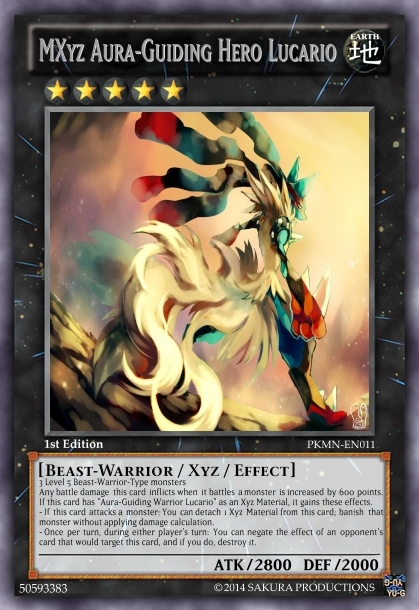 Monsters your opponent controls whose Levels and Ranks are equal or lower than this card's Level cannot activate their effects during the turn they are Summoned. Until the end of the 4th turn this card was Summoned, it gains 300 ATK/DEF during each of your Standby Phases. Target 1 face-up Xyz Monster you control; Special Summon from your Extra Deck, 1 "MXyz" monster with the same Type as that monster you control but 1 Rank higher, by using it as the Xyz Material. 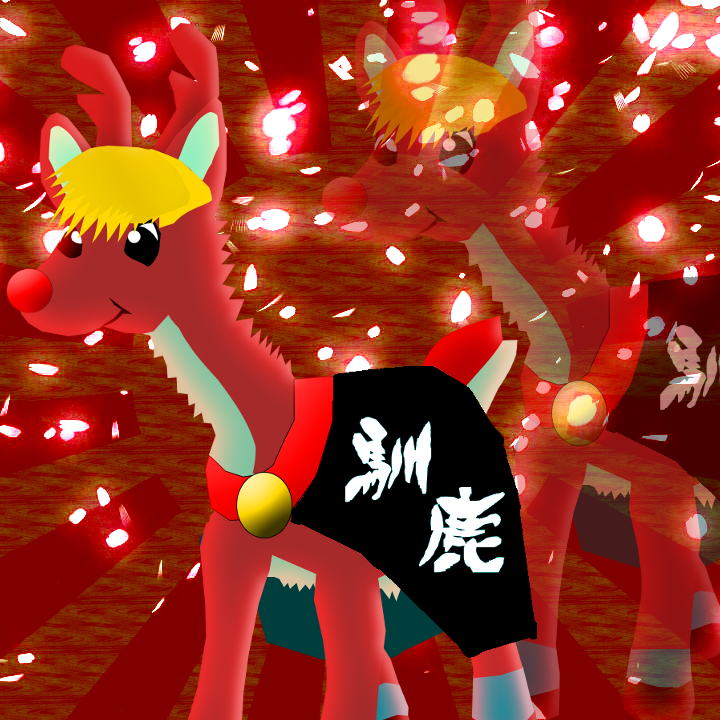 (This Special Summon is treated as an Xyz Summon. 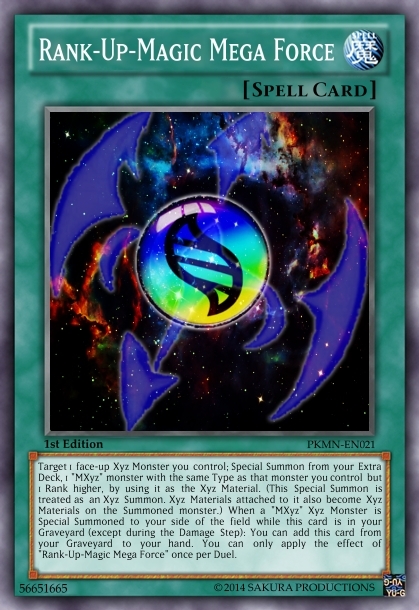 Xyz Materials attached to it also become Xyz Materials on the Summoned monster.) When a "MXyz" Xyz Monster is Special Summoned to your side of the field while this card is in your Graveyard (except during the Damage Step): You can add this card from your Graveyard to your hand. You can only apply the effect of "Rank-Up-Magic Mega Force" once per Duel. You're not required to CnC on all of them, because I know 20+ cards is a lot of stuff to cover in a single review. If you wish to give a general overview of things (either of the whole set or just a select group), that's also fine. Provided you give an adequate review as required by the AC, I won't mind at all. Well-thought out reviews will be repped. 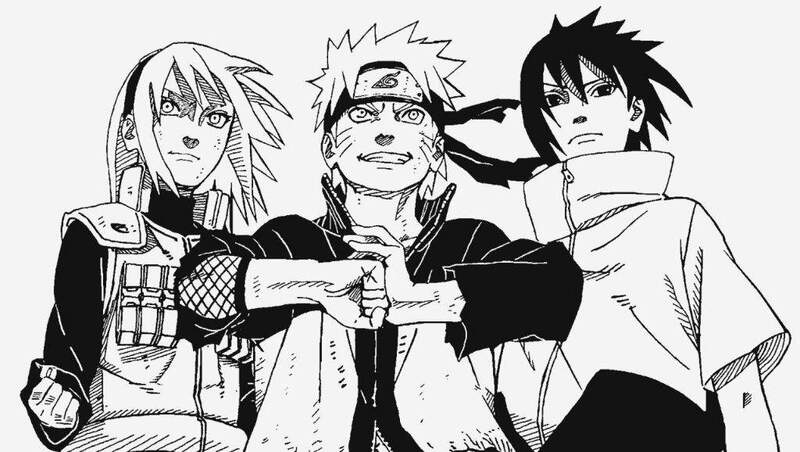 Edited by Sakura Haruno, 02 October 2016 - 05:21 AM. I will comment on the Swords of Justice because I helped with Keldeo and I want to be fair with the rest of them. This card is unaffected by your opponent's monster effects. If this card attacks or is attacked, your opponent cannot activate cards or effects until the end of the Damage Step. Finally, "when this card destroys a monster by battle" clause is unreliable nowadays (removal effects are rampant, the battle phase becomes less relevant after each format, etc. ), so I suggest to make the effect faster. 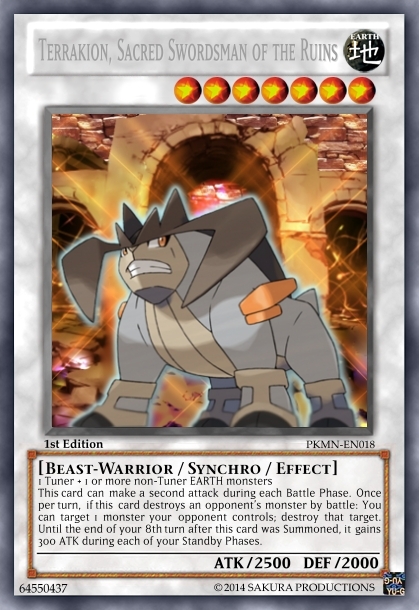 You could go for an OPT clause like Burei, or a Catastor/Nephilim clause ("At the start of the Damage Step, if this card battles a monster:"). Terrakion: This thing is huge. Even with the "when this card destroys a monster by battle" clause, this card can destroy up to 3 cards if nothing else gets in its way. I think this part of the card is fine, because it trades protection for raw power and destruction. What I don't like is its ATK boost of 500 per turn, because it means that during your next turn it will reach an intimidating ATK of 3500, and will continue to get bigger. 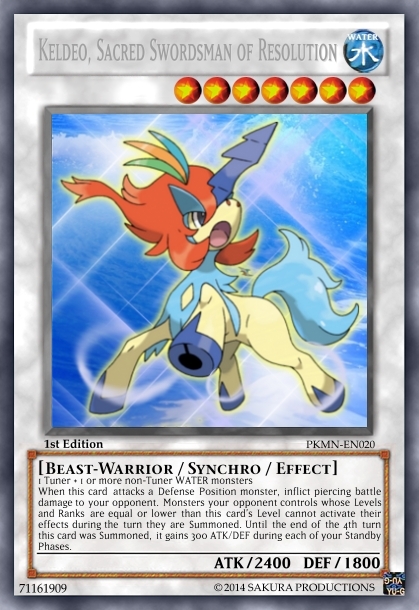 Now that we are at it, I think Keldeo's boost is fast as well, as it reaches a respectable 2800 ATK during your turn. I suggest to slow down these boosts and make them trigger during either your turn or the opponent's, instead of both player's turns. Virizion: It looks weak compared to the rest of the Swords, and it has 1 less effect than them. Again, the "when this card destroys a monster by battle" clause is unreliable, and negating attacks is not an impressive effect. As an idea, you could improve the effects of Giga Drain/Focus Blast: Halve the ATK/DEF of the target and gain LP afterwards. After all, LP is not as important and you would benefit more from halving ATK/DEF than reducing them by 700. also halving the ATK/DEF would add flavor since Focus Blast reduces by 1 stage, which essentially halves the affected stat. Focus Blast effect: At the start of the Damage Step, if this card battles a monster: You can target 1 face-up monster your opponent controls; that monster's ATK and DEF are halved. I suggest the negation side-effect on Giga Drain to make it more than a mere LP recovery effect, and to further improve Vizirion's disruptive capabilities. In addition, Virizion has a high Sp.Defense, so I guess for a third effect you cold give Vit a DEF boost as a counterpart of Terrakion. If you go for this, then Cobalion should add DEF with its first effect as well to properly support Virizion. Keldeo: I think you should nerf its ATK/DEF boost effect as I already pointed out. i especially like the artwork. it looks fancy XD. also, Rank-Up-Magic cards, lucario, Mega Lucario, and Rank-Up-Magic Mega Force has the best artwork. its very fancy. 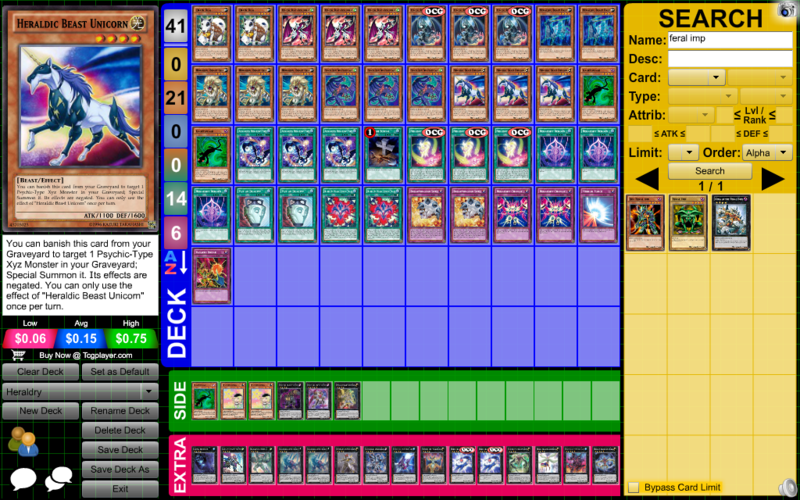 @Voltex: We don't need another Shi-En in terms of card negation; especially one that can be used every turn. Fixed that one on Cobalion and added the effect immunity to it [though it only blocks Poison for the most part]. Stat boosting effect increases DEF now; I had originally had it boost ATK/DEF but worried about it/Virizion since they already have relatively high DEF for Level 7 monsters [then again, Ancient Fairy/Pixie have 3000 DEF and are generic, so...] In terms of "Iron Head", works when it battles a monster now. Fixed Terrakion's stat boosting effect [Swords Dance essentially doubles the ATK of the Poke using it, but yeah pushing it to 3000 during opponent's turn really pushes it to be overpowered very quickly]. Nerfed it to 300 ATK during your own turn and made it during your turn only. 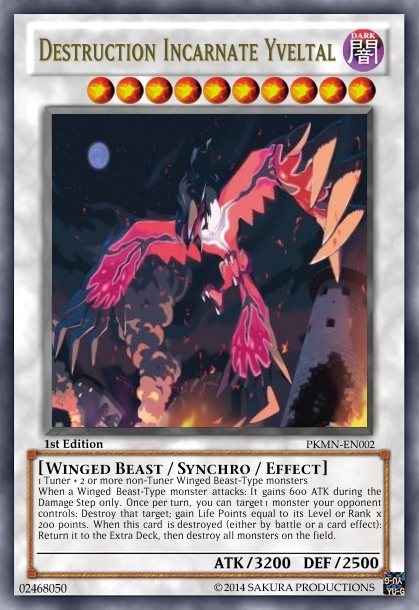 But you are right about its effect being pure destruction; considering most of its sets are generally wall-breaking types, which this card was designed after. Of course, your opponent could just Exciton/Mirror Force it or whatever though; but you already pointed that out. Virizion's effects have been fixed accordingly [Focus Blast and Energy Ball reduce a stat by 1 stage, which is essentially making it 2/3 of its original value, but that really doesn't coordinate well]. A third effect has been added, which mirrors Terrakion [though defensively]. Outside of Calm Mind though, Virizion doesn't have much options of boosting its special defense; unless I missed something. I was going to raise it to 2700 DEF so it can better serve as a wall if it needs to (based on last effect). 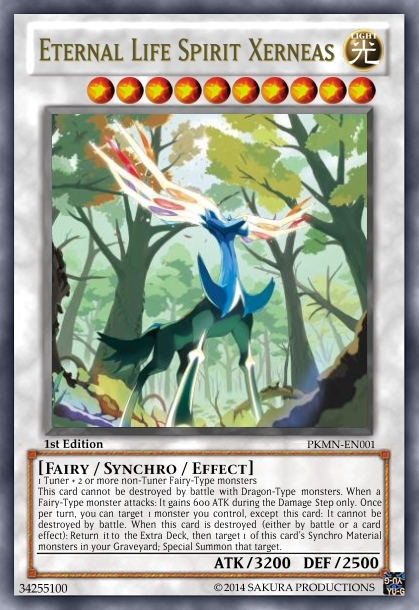 That being said, only Gusto/Mist Valley are capable of bringing this card out if I factor in real life Decks. 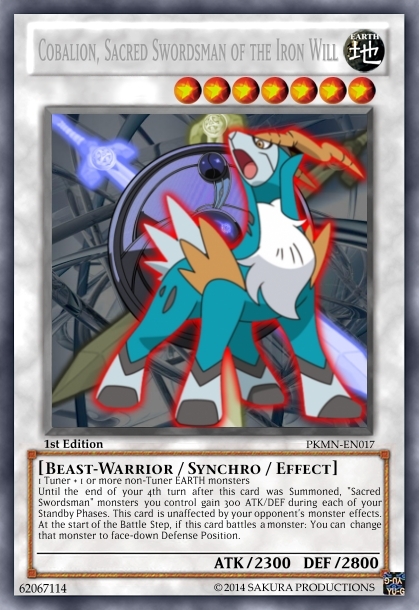 Keldeo's stat boosting got nerfed to work on your turn only [and 4 turns, so it remains constant with the other Swords that can boost every turn], though I did buff its stat gain to 300 ATK/DEF [from 200]. On your turn, Keldeo will reach 2700/2100; while it misses the 2800+ benchmark for usual bosses; it's enough to handle stuff on its own for a while. It's a little weaker than how it would be if I had left the effect as is, but encourages opponent to try getting rid of it quickly, otherwise it simply pumps up and eventually kills their monsters. In a way, it'll still reach the 3600 ATK with its "Calm Mind" effect, but just that it'll take a bit longer to get there. In a way, try to retain the Calm Mind reference that you suggested earlier, but also factoring in speed so it doesn't get overpowered quickly. @unknowngamer: Only ones I designed on own were the Sacred Swords, both Eons and the RUM. Everything else was found on Google Images somewhere. 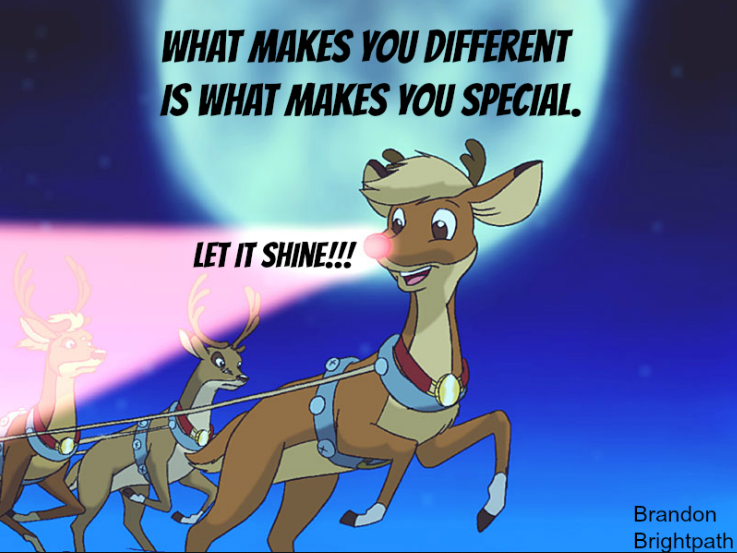 On that note, remember what I told you in the regular Keldeo thread; you need to give more constructive feedback on stuff. 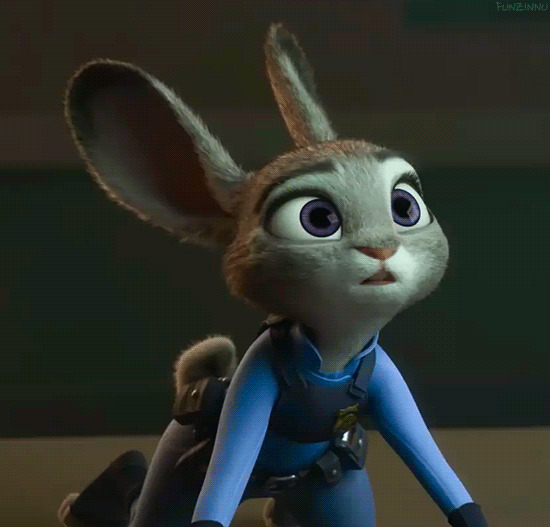 It's fine to say that you like the pictures, but we're not in the Showcase section. You need to give comments that are relevant to the card's effects/stats/design or whatever. My mistake, I thought that -1 stage actually was -1/2 stat reduction, but I guess that halving ATK/DEF is still more flavorful. Since Terrakion, Keldeo and Virizion get stat boosts for multiple turns, I suppose Cobalion's stat boost effect could work the same way, if only to make it more fair, even if it compromises flavor. An original ATK of 2600, and +200 ATK during each of your Standby Phases for 13 turns. That way, it will eventually gain 2600 ATK, essentially doubling its ATK as if it had used Swords Dance, and while it will take much longer, it won't make Terrakion less of a threat since it will reach a respectable 2800 ATK, hitting the boss benchmark, during your next turn. 250 ATK during each of your Standby Phase, for 10 turns. It would take less turns to double its ATK, but it will start weaker and won't hit the 2800-ATK benchmark during your next turn. Heck, you can just comment on one of the card groups [they are organized for you] with a proper 4-5 sentence review of them as a whole (or separate if you want, like Voltex has done thus far); that's fine. @Voltex: To keep the flavor with the other Swords, Cobalion's effect should just boost them continuously for a couple turns. 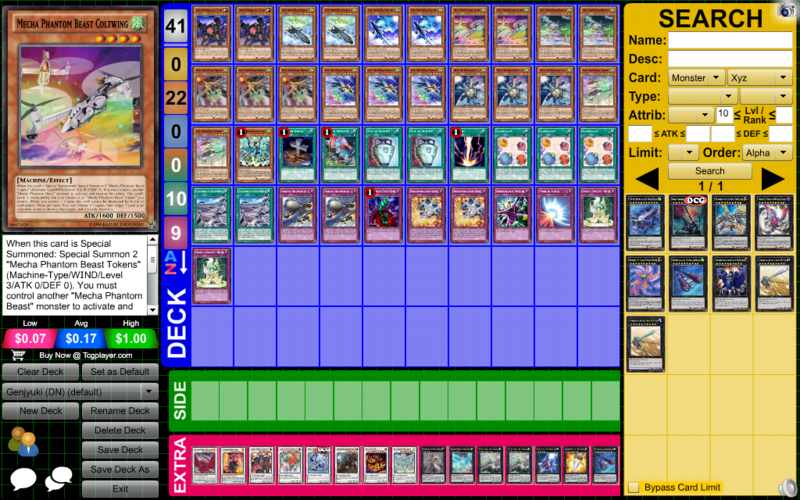 Then again, there are some consistency issues with running all of them in same Deck (Terrakion/Cobalion can be run together in EARTH decks like Naturia, X-Saber, Karakuris [I think] or some other stuff that I missed), so the boost will probably only affect itself for most part. Team matches could maximize this, but since most reviews are kept to a 1v1 match; won't elaborate on it much. I'll keep it at 4 turns, like the other Swords. Virizion could use a slight attack buff as 2300 ATK on a Level 7 isn't particularly enough to run over stuff on its own; especially when only 2-3 Decks can actively make this (Gusto, Mist Valley and maybe Harpies if they choose to run a Tuner, which I don't recall them doing). It does learn Calm Mind though, so it'll help a bit. Halving ATK/DEF is still going to be retained, since it helps Virizion's cause with keeping common monsters in check. It is mostly a defensive wall, but it certainly can hold its own in battle if needed. In terms of Terrakion, I originally planned to make him have 2600 ATK but decided against it due to its old stat boosting effect [and that finding a round number that's divisible by it would've be hard]. Can adapt the secondary option provided; retain the 2500 ATK [it's enough to destroy most things] and just make the boosts last longer (I don't really like using stat increases that aren't divisible by 100; so might retain the 300 boost it has now and have it go to 8 turns). It'll be a little off of 5000 (4900 to be exact), but this is when balancing a card and representing its actual effects / sets in the game collide. Considering that I did sort of push for this section to show better card design/balance [because of quality control], might have to do latter option. Granted, it does reach 2800 on next turn; which is enough to tie with most ace monsters, but your opponent can still kill it on its initial turn since it's still at 2500 ATK [while it's still a respectable amount + can deal with its fair share of stuff; most bosses can deal with it, along with regular effect removal]. If opponent doesn't get rid of it, their whole field will be destroyed in a matter of time [either Terrakion just flat out kills them or the Earthquake effect finishes off whatever it can't kill in head-to-head]. Might tone down its destruction effect a bit, because as you mentioned earlier; it has the capacity to mow down 3 monsters each turn; assuming your opponent's backrow and other things are dealt with. I made the necessary fixes as noted above; keeps the suggestions that you've made, but also with a bit of my own input on the matter. At this point, not really minding if cards aren't exactly sorted by type, since they're spontaneous at the time of creation (considering I've made these since January). Guess I'm bumping this because of the update. Added Heatran as card #16 (you noticed that I did skip it in the earlier update). Basically, its effects are designed on more of a defensive set it can run on Smogon (Rocks to cut down the opponent's strength and its signature move in keeping the opponent from doing much with the monster targeted; factored with some burn). As stated in the notes, adding an effect that emulates Roar (bouncing) would be nice for it (could probably afford to add it. Either that, or I scrap the SR effect and make it a more offensive one [think it's a bit slow for this game]. As of now, ending this at 21 cards (20 monsters and that one RUM card). I'll save the rest for a second set if I ever get the time to do one, outside of my RC-level stuff. Maybe more Mega Evolutions or something; don't really know at this point. Heatran looks weak in my opinion. The "Burden of the Mighty" effect is fine, albeit slow, but the other effect is underwhelming: Even while it locks the monster for a considerable amount of turns, if you target a low-Level and/or weak monster it will be pointless because Heatran can simply run over it with its 3000 ATK, and if you target a stronger monster the effect won't be too effective since it doesn't remove or weakens the threat/wall (you would have to wait for Heatran's first effect to debilitate it), and if is a Fusion/Synchro/Xyz monster chances are the opponent won't be using it as material for a Fusion/Synchro/Xyz anyways. Another point is that, since this is Level 8, you might as well Synchro Summon a Red Dragon Archfiend or even Scrap Dragon instead to effectively remove the opponent's monster(s). In other words, Heatran is not at the level of some of the generic Synchro 8s available. 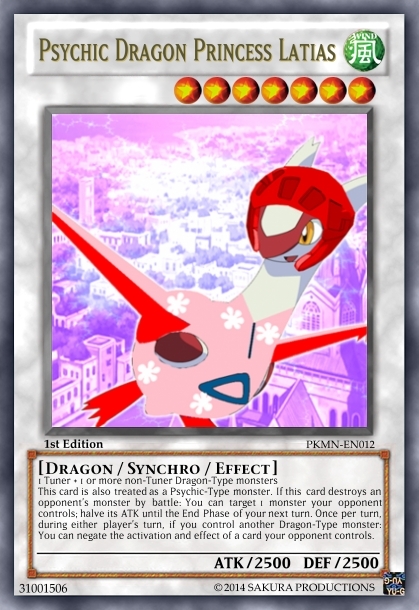 When this card is Synchro Summoned: Return all other monsters on the field to their owner's hand. This card cannot attack the turn you activate his effect. The "cannot attack" restriction not only keeps the card on check, but also adds flavor because it simulates Heatran using Roar instead of using an offensive move (attacking). You can further strengthen this restriction by skipping the Battle Phase if you want. 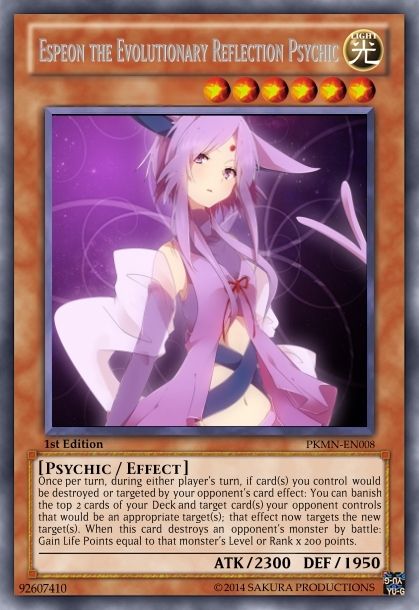 It also affects your side on the field to make it slightly more balanced by discouraging or punishing you for summoning this while you have an established field. Finally, this is just me being picky but I think it would be better as a FIRE/Rock-Type, if only to add a bit more of originality because the FIRE/Pyro combination is overused and boring in my opinion, whereas FIRE/Rocks are scarce (searching on DN, it only shows up 2 monsters with that combination). I know the Pokemon is not even Rock Type, but it has a magma theme so it would still make sense. I buffed the first effect a bit, making it 200 per turn instead. With that said, high Level/Rank monsters will get crippled more by it. 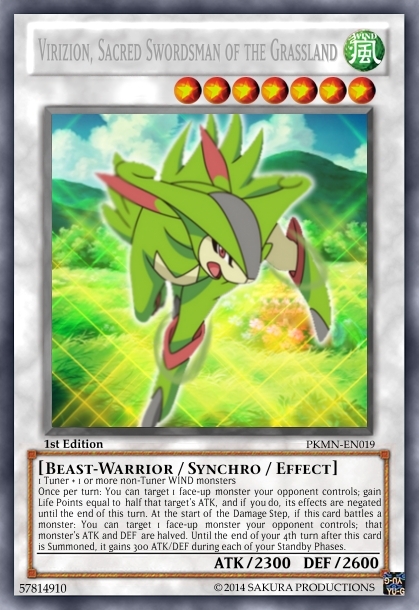 Added the Roar-esque effect, though in actuality, Roar only bounces 1 of your opponent's Pokes out; not everything else (but it can be seen as the bouncing variant of Exciton to some extent). At the most, you can still summon the bounced monsters again with some method (either you Pendulum Summon them or whatever). This one will be potent enough to mess with a lot of Decks. I scrapped the second effect and just made it a generic 800 point burn. Also has an OPT clause on it, though I don't think you'd be able to get a second one out (some Decks might be able to). As for the typing, it's changed. 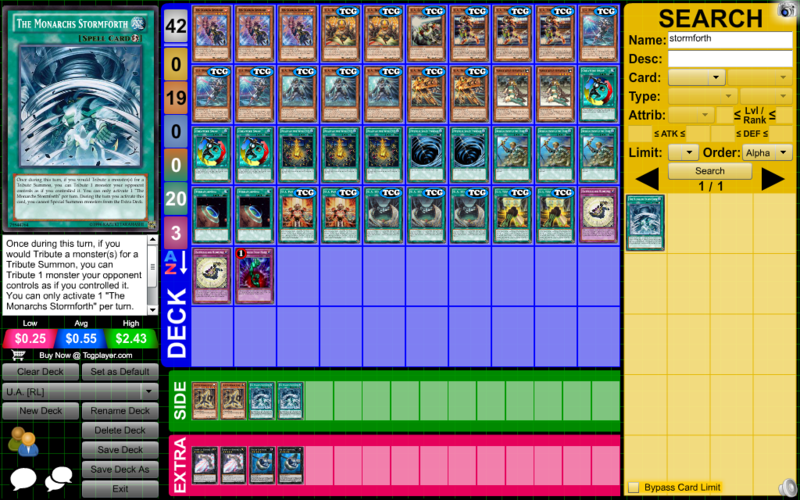 FIRE/Machine could have worked as well [to reflect its Steel typing], but then it becomes Overload Fusion fodder or something; factoring in the support cards Machines have to look forward to. Thanks for your critique so far; it's helping.